Fresh and healthy airport foods do exist but who has the time to pre-plan and search? Here at Vane we are obsessed with finding healthy meals to make any trip a happier one. The airport can throw off your healthy eating game because your options are often limited. Even when there are healthier restaurants and cafes at an airport, you may not know where to find them. Sometimes a healthy spot you’re looking for is in another terminal or its inaccessible from the part of the terminal you’re in. Or maybe it’s pre-security and you’re already past security. Our latest airport food journey has resulted in 8 foods that may make your next travel day a healthier one. Cava Mezze Grill celebrates the flavors of their families’ traditional Greek and Mediterranean fare. This yummy bowl has black lentils, mixed greens, tzatziki, spicy turmeric tahini, grilled chicken, pickled onions, tomato + onion salad, cabbage slaw, banana peppers and lots of lemons. Location: Ronald Reagan Washington National Airport. Post-Security, Terminal B, Near Gate 16. Giraffe at Dubai International Airport makes healthy yummy salads like the one pictured above. The restaurant is all about discovering new dishes and sharing them with everyone. We like the sound of that! Location: Dubai International Airport. Terminal 3, Concourse A. Open 24 hours. There’s a super tasty selection of healthy gluten-free food at EXKi at Charles De Gaulle Airport in Paris. How yummy is this rice noodle salad with beetroot, carrots, beans & cabbage? Their restaurants are turning to green energy and are furnished with a maximum of recycled materials. Location: Paris Charles de Gaulle Airport, Terminal 2F. Need more greens in your life? Try this mix of arugula, chickpeas, kalamata olives, pickled onions, figs, and mint vinaigrette. The restaurant is an upscale dining experience featuring premium ingredients from regional farmers and purveyors. 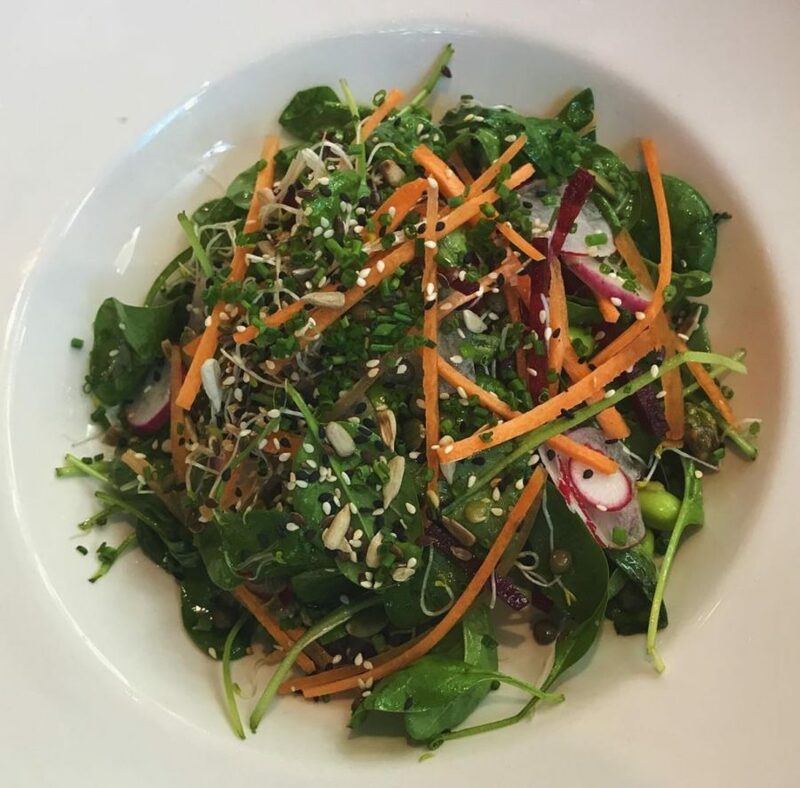 We love this edamame and kale salad from Hudson’s Coffee, it looks super tasty, and just what you need to stay healthy on the fly. Locations (5): Melbourne Airport. Before security: In the walkway between T1 and T2; in T2 opposite McDonald’s; in T3 opposite the baggage carousels. After security: T2 between gate 2 and 4; T3 next to gate 3. La Place offers freshly prepared foods made with seasonal ingredients at Madrid-Barajas Airport in Spain. This picture is just veggies overload. Location: Madrid-Barajas Airport. Terminal T4, Floor 1, Departures, Boarding Area J.
Marché at Zurich Airport provides many healthy options like salads you can make on your own, and fresh juice too. Location: Zurich Airport. Airside Center. You can get the above delicious looking salad at Long Neck Public House at Perth Airport. More details about this healthy looking spot here. Location: Perth Airport. Terminal 1 & Virgin Domestic Terminal 1. Open from 4 am ‘til late, 7 days a week.